Copyright 2005 Mathematics Education Research Group of Australasia Inc. This paper considers the evolution of research in statistics education since the introduction of chance and data into the Australian mathematics curriculum in 1991 and presents selected outcomes of research into students’ understanding of the content in the chance and data curriculum, using them to argue for a change in emphasis in the classroom in the teaching of chance and data. These suggestions might also influence current curriculum revisions taking place within Australia and New Zealand. 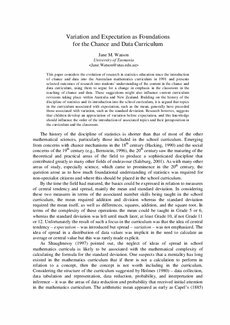 Building on the history of the discipline of statistics and its introduction into the school curriculum, it is argued that topics in the curriculum associated with expectation, such as the mean, generally have preceded those associated with variation, such as the standard deviation. Research however, suggests that children develop an appreciation of variation before expectation, and this knowledge should influence the order of the introduction of associated topics and their juxtaposition in the curriculum and the classroom.